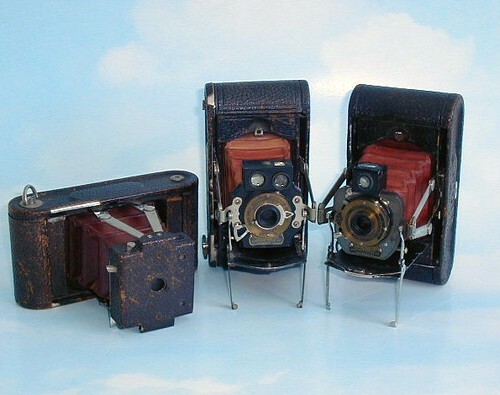 The Folding Pocket Kodak was a folding camera made by Eastman Kodak Co. Ltd., Rochester, from 1897-98. Frank Brownell was its designer. It took 2 1/4×3 1/4 exposures on Kodak 105 film rolls and had an Achromatic f/11 lens. The price was $10. The camera model had been renamed to Folding Pocket Kodak No. 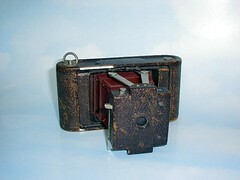 1 to distinguish it from the newer Folding Pocket Kodak No. 1A. The No. 1 stood for the smallest format in Kodak's rollfilm exposure format portfolio: 1, 1A, 2, 2A, 3, 3A, and 4 .